Having established a reasonable range of works painted by De Nittis during his short career, I will now use those to consider whether he painted Impressions, and whether he was a member of the group we know as Impressionists. Taking some of the more likely candidates from among De Nittis’ works, I assess them as follows. Country Road – the Bank of the Ofanto (c 1874-5) scores around 10 out of 12, making it likely to be an Impression. On the Bench of the Champs Elysées (c 1878) scores around 11 out of 12, making it very likely to be an Impression. The Orange Kimono (c 1878) scores around 10 out of 12, making it likely to be an Impression. 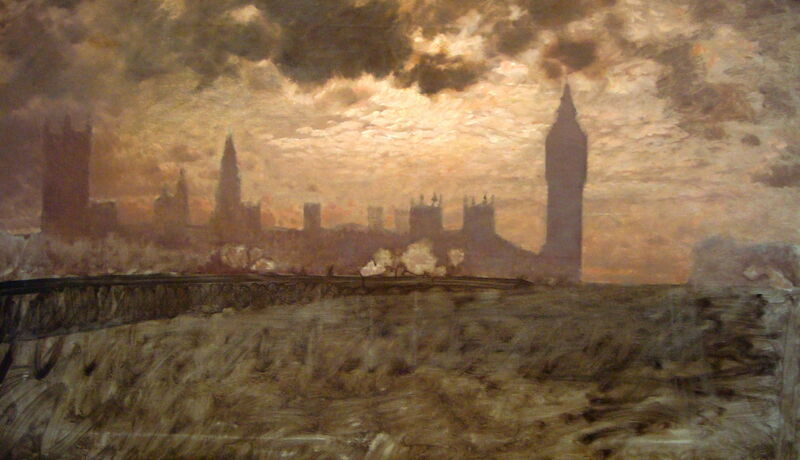 Westminster Bridge (1878) scores 12 out of 12, as you might expect from a painting similar in many respects to those made by accepted Impressionists of similar motifs, and is clearly an Impression. Snow Scene (1880) scores 11 out of 12, so is very likely to be an Impression. In the Fields around London (c 1881) scores around a perfect 12, making it an Impression, much as similar paintings by accepted Impressionists such as Monet would be. In the Lamplight (c 1883) scores around 9 out of 12, making it possible that it is an Impression. Of course there are many of De Nittis’ paintings which score far lower: those intended for the Salon or similar exhibition often achieve scores of 6 or less. However it is clear from the above that De Nittis did – some of the time at least – paint Impressions. These were also mainly painted during the 1870s, the period in which mainstream impressionists such as Monet and Pissarro made many paintings which also score highly as Impressions. 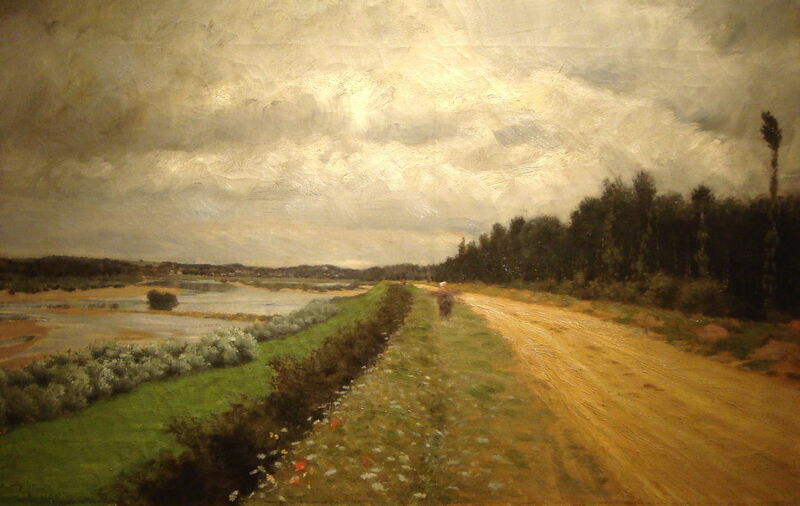 De Nittis was therefore in synchrony with those of the main Impressionist movement. 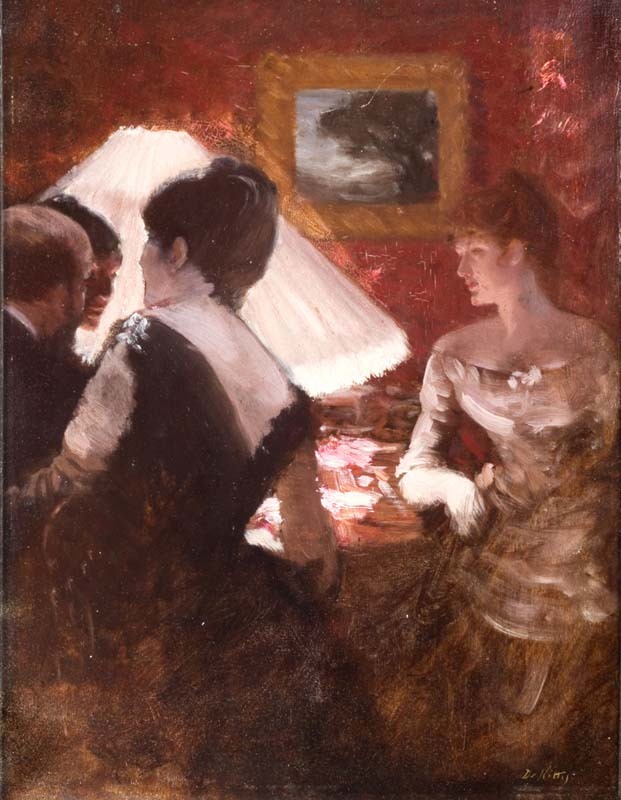 One significant difference between De Nittis’ paintings and those of other Impressionists is his control over facture, the way in which he was able to vary the coarseness of his brushstrokes and the detail of objects in different passages, much in the way that portraitists had done for a long time. 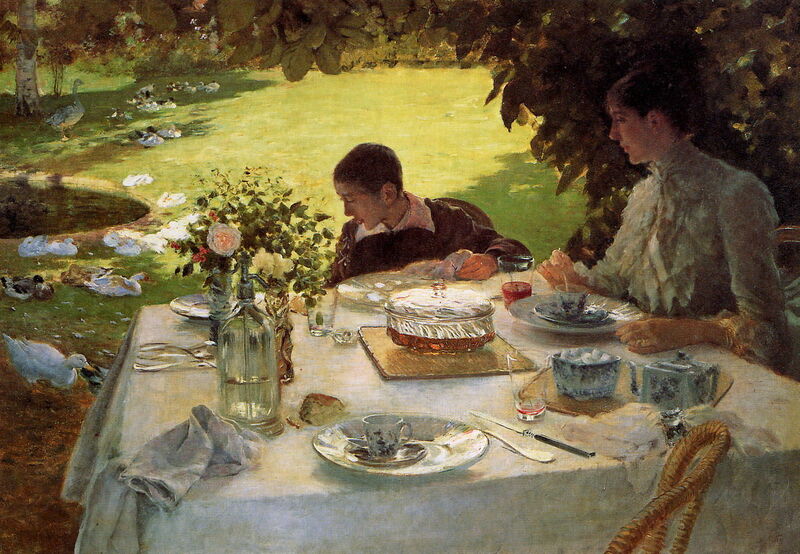 Probably the consummate example of this is his Breakfast in the Garden (c 1884): the foreground is crisp and detailed enough to show the fine highlights on glass, china, and metal, and the sharp outline of his son’s head; his wife’s blouse, the ducks and garden in the background are delightfully loose and painterly. But that can hardly be claimed as a fault. Simply showing works at one of the Impressionist Exhibitions, even the first in 1874, does not qualify a painter as being a member of the group which we term The Impressionists. As I have written, several of those whose work was shown at that first exhibition were not in the least bit impressionist, even if they had paid their fees and took part in the group’s meetings. 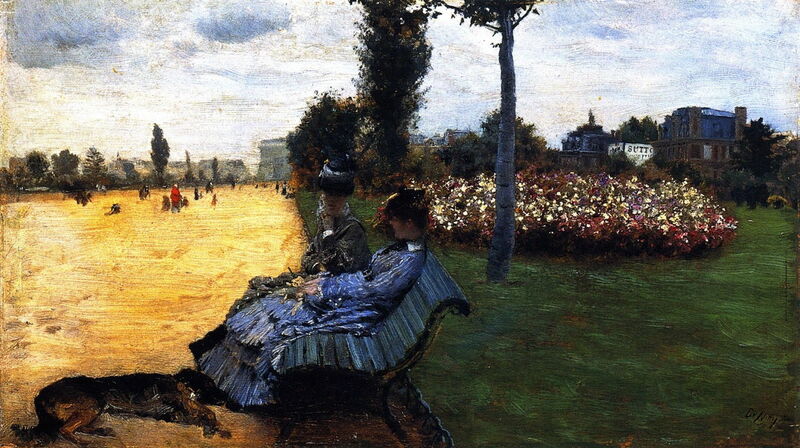 When De Nittis first came to Paris in 1867, he made friends with Manet and Degas, as well as other artists and writers. His friendship with Degas lasted until De Nittis’ death in 1884. 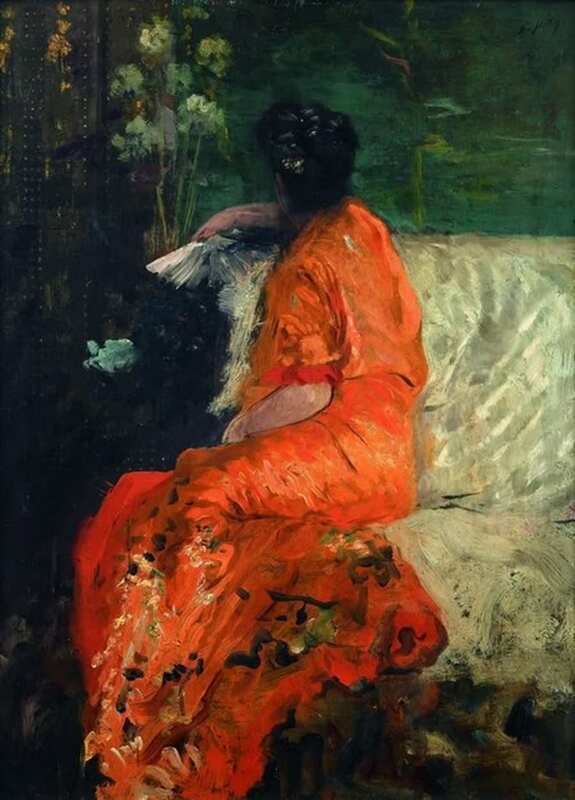 During the 1870s he developed an enthusiasm for Japonisme, which was characteristic of the Impressionists at the time, and he reflected this in some of his paintings, such as The Orange Kimono (c 1878). In the late 1870s, he and his wife socialised frequently with Degas, Manet, and Caillebotte. Although his circle does not appear to have included Monet, Berthe Morisot, or Pissarro, he bought, collected, and appreciated paintings by Monet and Morisot. At the time of his death, De Nittis owned at least four paintings by Monet, one by Morisot, four by Degas, and one by Manet. 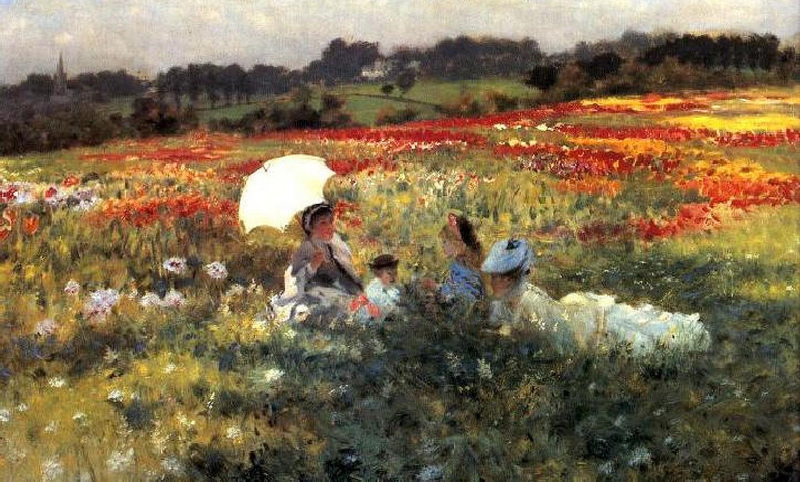 De Nittis’ career took a different form from those of others such as Monet. His youthful move from the studio to painting in front of nature, in his Scuola di Resina, paralleled the early Impressionist shift en plein air. But De Nittis submitted paintings successfully to several Salons, including those of 1869, 1872, 1874, 1875, 1876, 1877, 1879, and 1884. He also had works included in the Universal Exposition of 1878, and Petit’s International Expositions of 1882 and 1883. 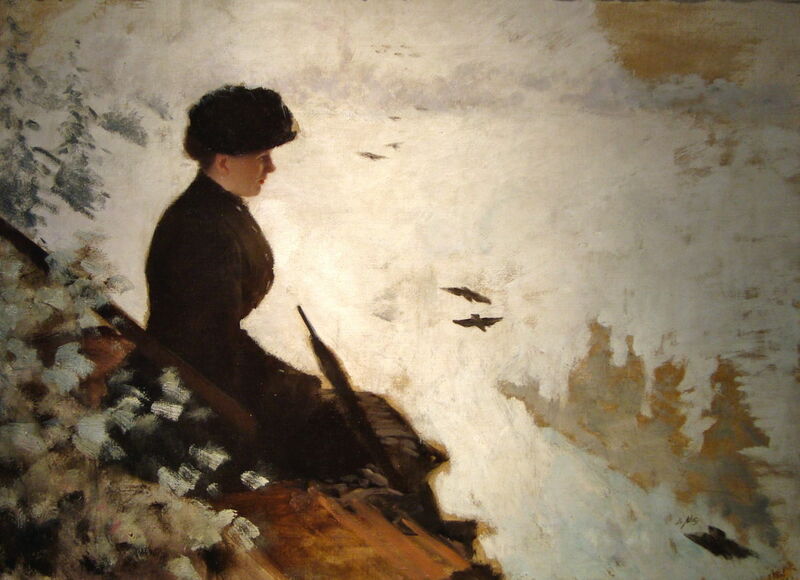 However, others now considered to be core Impressionists also exhibited when they were able to: Degas had paintings accepted for the Salon from 1865 until the Franco-Prussian War in 1870, and several of the Impressionists submitted paintings to the Salon, sometimes being shown in the Salon des Refusés. Their paintings were also shown by dealers, including Georges Petit, Goupil, and Durand-Ruel, who represented De Nittis too. De Nittis was significantly earlier to achieve commercial success, during the 1870s, whereas Monet had to wait until the late 1880s. Degas always maintained that he was not an Impressionist, and his paintings are generally far less ‘Impressions’ than many by De Nittis. If Degas qualifies as one of the French Impressionists, then surely De Nittis should be included as the Italian Impressionist. Posted in General, Painting and tagged Caillebotte, de Nittis, Degas, Impression, Impressionism, Italy, japonisme, Manet, Monet, Morisot, painting. Bookmark the permalink.